Mahk is an Orc warrior living in Dushnikh Yal, the Orc stronghold southeast of Markarth. He works in Dushnikh Mine, mining orichalcum ore along with Ghak, Dulug, and Oglub. Like his co-workers in the mine, Mahk spends his entire life in the dark tunnels and never sleeps. He divides his time between hacking away on the ore veins, relaxing, or eating. He wears a set of miner's clothes with boots and gloves. 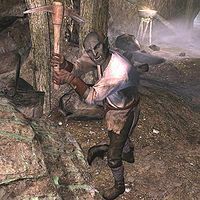 He carries his pickaxe, a leveled war axe, the key to Burguk's Longhouse, and a selection of common items and gold. This page was last modified on 11 December 2013, at 22:31.